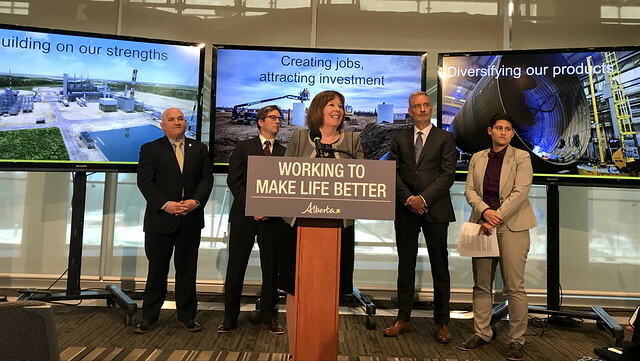 The government is taking action to grow Alberta’s petrochemicals sector and increase ethane supplies, which will create new jobs, attract private investment and help diversify the energy sector. A combination of loan guarantees, grants and royalty credits would support an expanded Petrochemicals Diversification Program and a program to ensure needed infrastructure for petrochemical feedstock. Along with the previously announced Partial Upgrading Program, these proposed initiatives are expected to attract more than $10 billion in private investment, support roughly 8,000 construction jobs and create hundreds more operational jobs. These programs form the three pillars of The Energy Diversification Act , tabled in the legislature on March 8. The second round of the Petrochemicals Diversification Program would expand to accommodate proposals that include using ethane, in addition to propane and methane. Ethane, methane and propane are all considered petrochemical feedstocks and are sourced from natural gas and natural gas liquids. Expanding to include ethane uses would encourage applications for building a new ethane cracker, a large-scale complex petrochemical facility that converts ethane to the necessary components for plastics, detergents, lubricants and other household products. Alberta’s petrochemical manufacturing industry employs more than 7,500 people directly with annual exports of $8.2 billion, the largest the manufacturing sector in the province. Two successful applicants were awarded support under the first round of the program in 2016. Calgary-based Inter Pipeline received credits for a portion of its $3.5-billion propane-to-polypropylene complex which is already under construction in the Industrial Heartland near Fort Saskatchewan. At the peak of construction, an estimated 2,300 direct full-time jobs would be created and, once complete, the facilities would employ 180 people. Alberta has only captured a small part of the $185 billion of investment in value-added sectors over the last decade, as reported by the Energy Diversification Advisory Committee. These programs would increase Alberta's competitiveness with other jurisdictions, including the U.S. Gulf Coast, and ensure a greater return on the investment for Albertans over the medium- and long-term. Successful projects represent thousands of construction jobs and hundreds more in operations as well as increased royalties and tax revenues for the province and municipalities, which help pay for services Albertans rely on. The second initiative, the Petrochemicals Feedstock Infrastructure Program, would focus on helping secure a larger supply of the raw components needed in petrochemical manufacturing. The investments would encourage industry to move forward on the facilities and infrastructure needed to capture more natural gas liquids required for value-added development. This includes components such as ethane, methane and butane, with ethane recovery being the primary focus. These two programs complement each other because the greater and more stable the supply of these raw components, the greater the potential of attracting and supporting more value-added developments in Alberta. As recently announced, the Partial Upgrading Program would help support full-scale commercialization of partial upgrading technologies through the construction of two to five facilities, representing up to $5 billion in private investment, 4,000 jobs during construction and 200 full-time jobs during operation. These initiatives support the vision of the government’s throne speech and build upon recommendations from the Energy Diversification Advisory Committee.